Still waiting for a dry weekend to start taking pictures for the restoration thread. Call me overcautious, but the bike won't leave his "warm bed" as long as it's wet outside. The frame is a quite good exemplification to get an idea why it's foolish to clearcoat a steel frame. 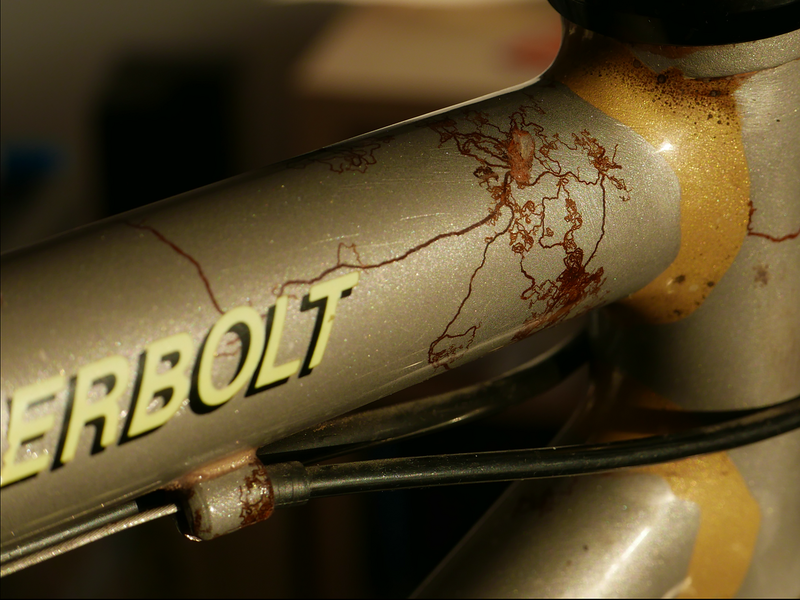 Most of the rust is only superficial. On the upside you can see whats going on, how many frames rot quietly away without the owner knowing until its to late. Yeti clear coated their bear frames, however I'll conceed they never had longevity in mind nor cold Germanic winters. Please start a new thread in the build section...nice to see something interesting. That rear brake position makes no sence, surley all mecanical advantage is lost..making them less efective.